As was universally expected, the Bank of Canada’s Governing Council held overnight interest rates steady at 1-3/4% as it heralded a weaker outlook for the Canadian economy. The dovish tone in today’s Bank of Canada statement is in direct contrast to its attitude when it last met on October 24. Since that time, the global economy has moderated, and oil prices have fallen sharply. Troubling prospects for Alberta’s energy sector have weighed on the economy as the U.S. has expanded shale oil production. Benchmark prices for “western Canadian oil–both heavy and, more recently, light–have been pulled down even further by transportation constraints and a buildup of inventories”. The Notley government in Alberta ordered production cuts this week leading the Bank to conclude that Canada’s energy sector will be “materially weaker” than expected. The Canadian economy grew at a 2% annual rate in the third quarter, mainly in line with the Bank’s expectation, however, September data suggest significantly less momentum going into Q4. 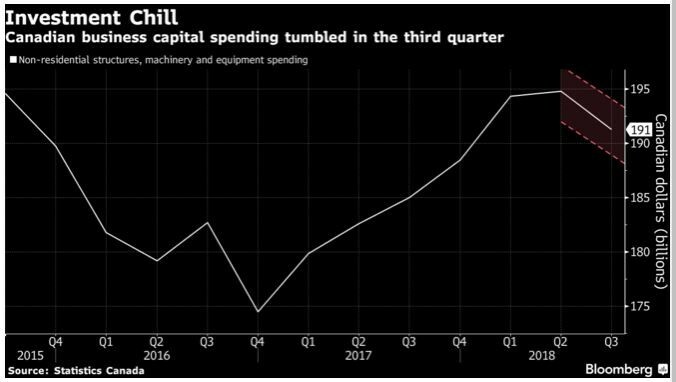 The biggest disappointment was the plunge in business investment, which likely reflected trade uncertainty (see chart below). Business investment outside of the oil sector is likely to improve with the signing of the new trade agreement USMCA, the new federal tax measures to improve capital depreciation write-offs, and ongoing capacity constraints. Household credit appears to be stabilizing following a significant slowdown in recent months. However, the rise in interest rates this year has had a more substantial impact on credit-sensitive spending than many had expected. 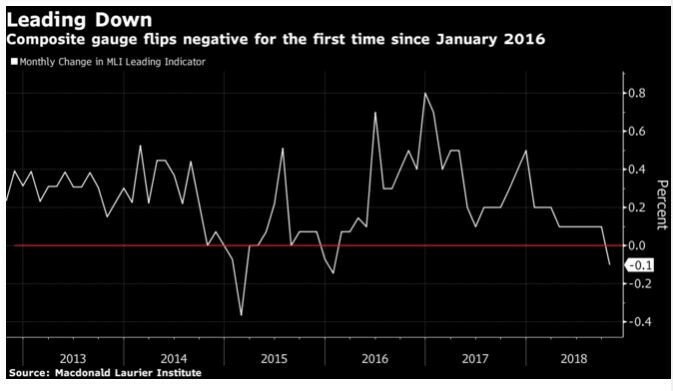 For example, plunging car sales add to evidence that higher borrowing costs are dampening economic activity possibly to a more significant extent than the central bank expected. Light vehicle sales dropped 9.4% in November, the most since 2009. As well, Bank of Canada data show growth in residential mortgages decelerated to 1.4% in September on an annualized three-month basis, the weakest pace since 1982. The Bank has raised borrowing costs five times since July 2017. New home building declined for the third consecutive quarter, down an annualized 5.9% in Q3. Moreover, according to the Toronto Real Estate Board (TREB), Toronto’s housing market posted its biggest monthly sales decline since March while prices remained little changed. 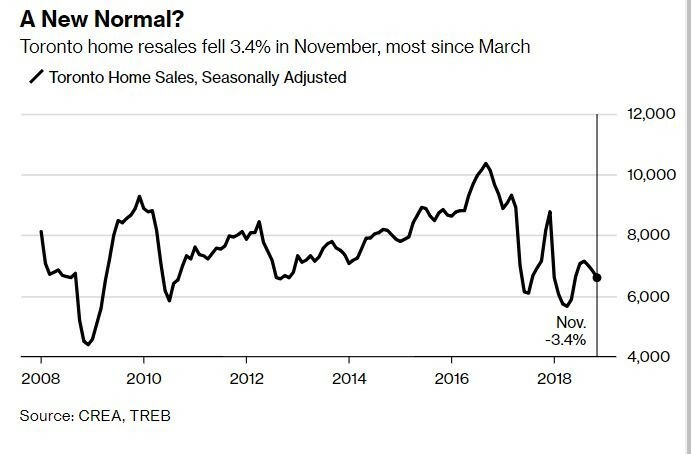 Sales in Canada’s largest city fell 3.4% in November from the previous month TREB reported today (see chart below). 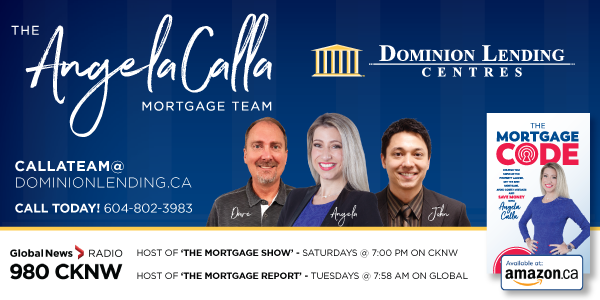 The housing market in the Toronto region has been stabilizing after a slowdown in sales and prices earlier this year amid more stringent mortgage-lending rules. The market picked up its pace through the summer, though sales have declined for the third month in a row. Economic data have been coming in below expectations according to Citibank’s Surprise Index, which tracks the difference between market expectations for economic indicators and their actual values. 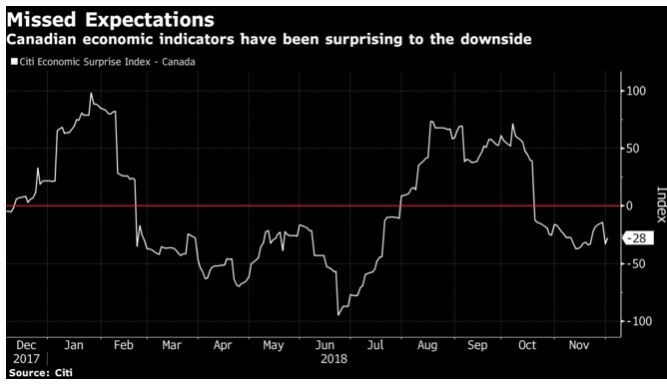 This index has trended downward since last summer and has been below zero since mid-October–around the time of the Bank of Canada’s last Monetary Policy Report (MPR) and the most recent rate hike. The Macdonald Laurier Institute’s Leading Indicator fell 0.1% in October. The composite gauge’s first decline since January 2016 was primarily driven by a pullback in S&P/TSX Composite Index, which fell 6.5% on the month, as well as marked decreases in commodity prices. “The persistence of the oil price shock, the evolution of business investment, and the Bank’s assessment of the economy’s capacity will also factor importantly into our decisions about the future stance of monetary policy,” the bank said. As recently as October, investors were expecting at least three more rate hikes in 2019. Currently, those expectations have lessened to no more than two. The Bank had previously estimated the “neutral” range for overnight rates at between 2.5% and 3.5%. Today’s more dovish statement might well indicate that rate hikes over the next year will be to levels well below this neutral range.